Manila may offer a good variety of good restaurant but when it comes to wine, Manila is not the only town in the Philippines where foodies and wine lovers can gather to indulge in a good meal with wine. Some travelers who were fortunate enough to find themselves in Pampanga, Angeles City, Subic on 19th September, 2015 enjoyed a memorable dinner at a popular restaurant in Clark. Wine lovers who attended this wine event in Clark were pleased that these regular wine appreciation events organized by Yats Restaurant are free of those irritating promotional and sales activities in the program. One thing that wine lovers attending these wine events really dislike is for anything to distract them from enjoying a relaxing evening of fine wine and good food. Nothing like that happened in this wine event in Clark. 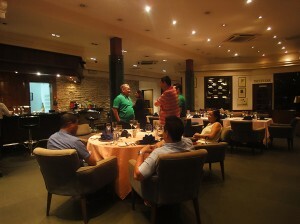 More about the wine dinner organized by this restaurant in Clark Pampanga…. Many visitors coming from out of town brought their families along for a relaxing vacation in the idyllic Clearwater Resort just a few minutes down the road. Located just at the rear of the row of shopping malls, this resort in Clark Pampanga is a favorite hotel for Manila families. This hotel is home to the beautiful lake in Clark Pampanga. It also offers excellent picnic gardens and camping grounds, making it a favorite venue for teambuilding and company outings in the Philippines More about this resort in Clark Philippines…. This entry was posted in Events, Philippines Wine Scene, Restaurants, Bistros and Eateries. Bookmark the permalink.